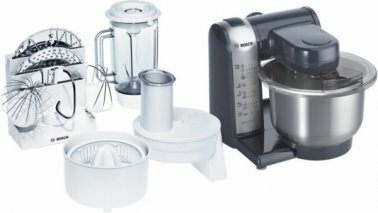 MUM4: A tried-and-tested classic among food mixers with exceptional Bosch quality and a wide range of accessories. Anthracite finish. - Great multifunctionality thanks to patisserie set (beating whisk, stirring whisk, kneading hook), continuous shredder with three discs for shredding, grating and slicing, blender attachment, citrus press and accessory stand.